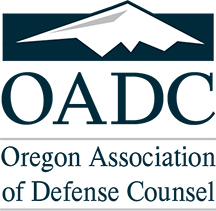 The OADC Amicus Committee reviews requests for amicus participation on issues in Oregon appellate courts of significance to the members of the OADC. The committee consists of some of OADC's most distinguished appellate attorneys and selectively identifies cases on which the OADC can provide useful input and perspective on issues which will have significant effect on civil litigation in the areas of law practice by OADC members. The name of the case and any appellate court numbers assigned to the case. The names of the attorneys for the respective parties involved in the case. Copies of all appellate briefs filed by any of the parties in the case. Copies of all appellate court decisions in the case. State the present status of the case on appeal and, if a petition for review has been filed with the Oregon Supreme Court, has the Court of Appeals or Supreme Court acted on the petition (if so, when)? If the Supreme Court has already granted review, has that Court requested any additional briefing by the parties or directed any questions in writing to the parties (if so, please provide a copy of any such correspondence)? Also, if the Supreme Court has granted review, has a date been set for oral argument? Are you aware of any other persons or entities who (a) have applied to file an amicus brief; (b) have already filed an amicus brief; (c) have indicated that they intend to apply to appear amicus in the case; or (d) have been contacted about appearing as an amicus party? If so, please list the names of any person or entity and the person's or entity's attorney. As to any person or entity listed in response to Item 6, please list which issues you think that person or entity might be addressing as an amicus party, and please provide us with copies of any amicus applications or briefs. State the issues you believe the OADC should address if it applies to become involved as an amicus party. List any other information that may assist the OADC Amicus Committee in deciding whether to recommend OADC becoming involved as an amicus party.